Above is a commission from the Big Apple Con that I just didn't have the time to get to last weekend. Thomas, the kind young man who ordered this commission as well as a few other was understanding enough to allow me to finish up the drawing for him at home. I felt bad about making him wait, so I decided to add in a little color to this one. Hope you like! Holy Banana !!!! It's AWESOME, Joe !!! Thanks so much!!! Can't wait to get this in the mail. 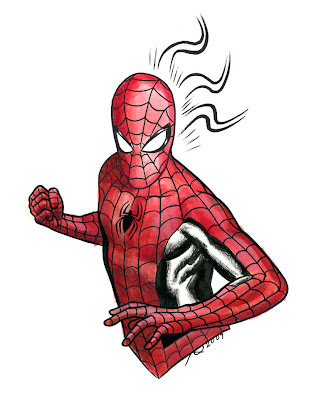 ( Just kidding, I love the Spidey/Goblyn Haloween piece too ). BTW Paolo & you really keep getting better & better. No - indeed you did not make a fool of yourself. This sketch is for YOU good sir! I'll be shipping it out tomorrow, so you should get it most likely by the end of the week. Glad you like it, and thanks for the kind words. I'm blushing. See you at the next con!